A short and narrow circuit on a closed public road, St Wendel could not be more different to the mighty Nurburgring we had left only the previous week. From the starting grid riders swept down a hill on a long curve to the right, at the bottom there was a sharp turn to the left, under a bridge followed by another left turn, up the hill and through a long S-bend, a short straight followed by a left-hand hairpin bend at the top of the hill before dropping down and crossing the start and finishing line once again. On this occasion, my entries had been accepted for both the 125 and 250cc races and there was no attempt to bump me up a class! Practice for both races was pretty uneventful, although I could not help but notice just how narrow the circuit was at racing speeds, being approximately half the width of Brands Hatch and many other U.K. circuits. It is possibly for this reason that the circuit is no longer used for motorcycle road racing? Again I qualified and had good starts in both races, but rather disappointedly, only managed a 14th place finish on the 125 and 11th on the 250. Not bad considering I had 2 or 3 close encounters with high kerbs and the straw bales protecting the buttresses of the bridge when trying too hard during the races. 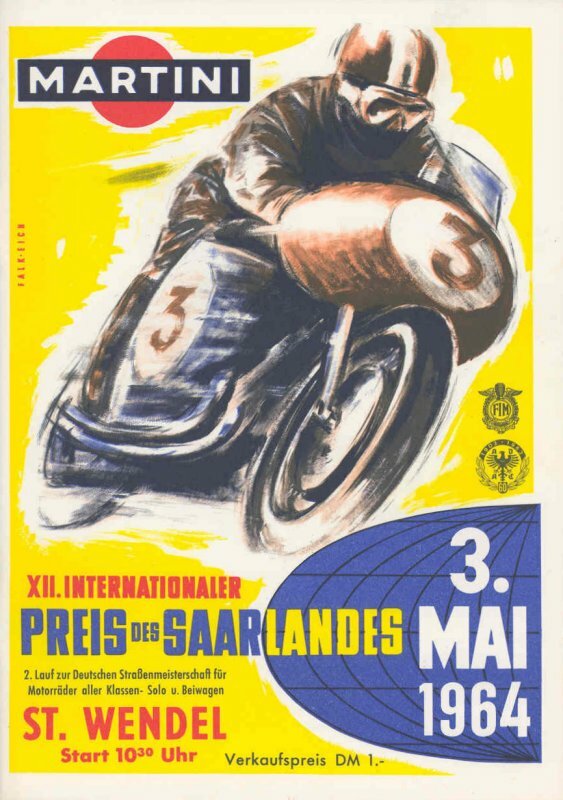 Chris Vincent won the 125 cc race followed home by Walter Scheimann and Giuseppe Visenzi – all mounted on Hondas. With a little more money in the bank (hidden in the Thames van in a steel tool box!) we joined the other competitors at the prize giving and celebrations put on by the Auto Club and town of St Wendel, before leaving, some with delicate heads, for Hungary the following morning.